Chicken poached in a garlic-cumin broth is from Hidalgo, in the central Eastern region of Mexico, the homeland of the great Toltec culture. 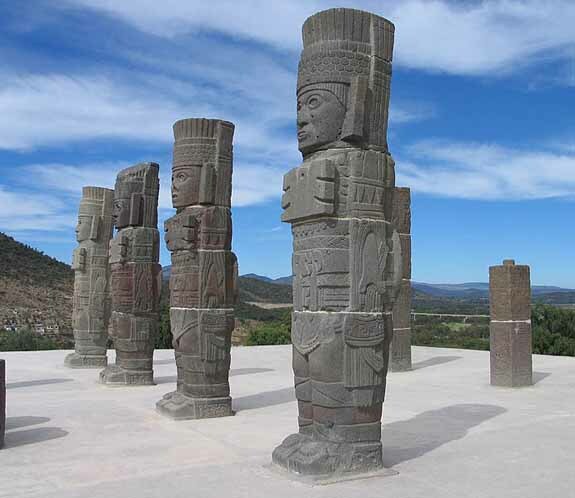 Toltec art and the huge monuments are well-known and iconic of MesoAmerica, but a lesser known fact is that the region has a delicious, distinctive cuisine. “Ajo Comino de Gallina” is a Hidalgo dish that uses poaching as a method for infusing flavors into food as it cooks with no fat. The French have a similar method, their Court Bouillon used to deep poach foods. 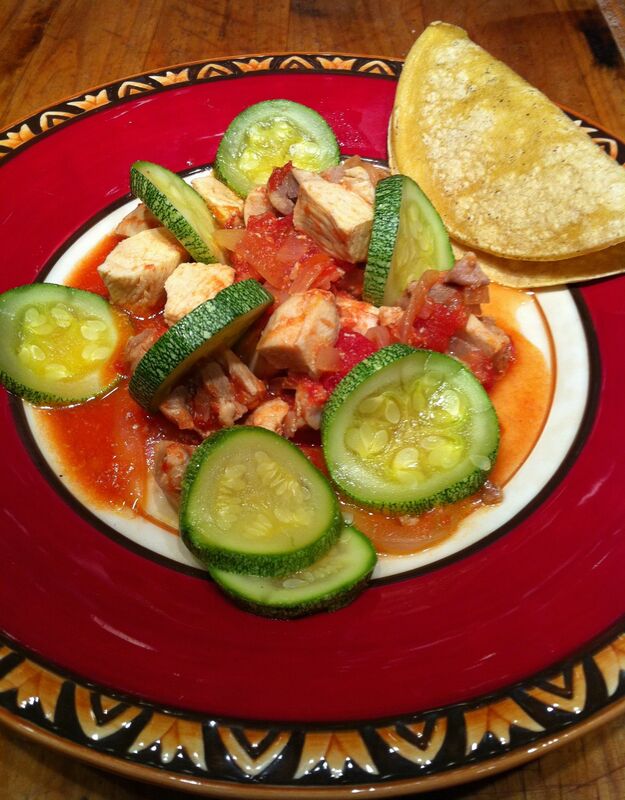 So I’ve used that Hidalgo cooking method to make the traditional Texas Mexican favorite, “Calabacita con Pollo.” I hope you’ll like, and I ask especially my Texas Mexican friends for comments. I recommend you try to find “tatuma” squash, which is an heirloom squash native to Mexico where it has been grown for 10,000 years. It’s delicious and has firm flesh. 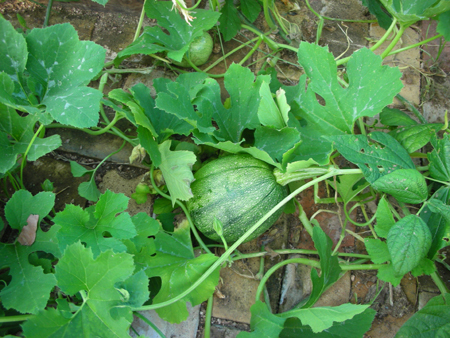 2 large Mexican Tatuma squash (Calabacita) 1/4″ slices. You can substitute zuchini if Tatuma is not available. 1. Place the water, garlic and cumin In a large skillet or sauté pan and bring to the boiling point. 2. Add the chicken pieces and keep the fire on high to bring the liquid back to a low simmer. Lower the heat and keep poaching at a very low simmer until the chicken is fully cooked, approximately 20 minutes. 3. Remove the chicken and hold warm. 4. Strain the liquid with a fine mesh sieve and hold. 5. In a Dutch oven or deep skillet heat the Canola oil. 6. Add the onions and cook until they are soft and translucent. 7. While the onions are cooking, grind the Serrano chile into a fine paste using a molcajete. Add a little of the strained broth to the molcajete to lift off the paste and add to the onions. 8. Add the tomatoes, 1 1/2 cups of the strained broth and cook this sauce, uncovered, on medium heat for 15 minutes. 9. Add the chicken pieces and continue cooking until the chicken is heated through. and cooked covered until soft, about 10 minutes. Add salt to taste. Serve the chicken topped with the Calabacita and with hot corn tortillas.